Jim serves as Taft's Senior Strategic and External Affairs Advisor. His involvement on various boards and with many projects in the community and beyond offers an avenue of experience to benefit fellow community members. Jim stepped down in 2009 as president and CEO of Cincinnati Children’s Hospital Medical Center, a position he had held since 1996. He was instrumental in shaping the extraordinary growth at the medical center. Since that time, the Anderson Center for Health Systems Excellence has been named in his honor, and he has continued to contribute to the medical center as advisor to the president. 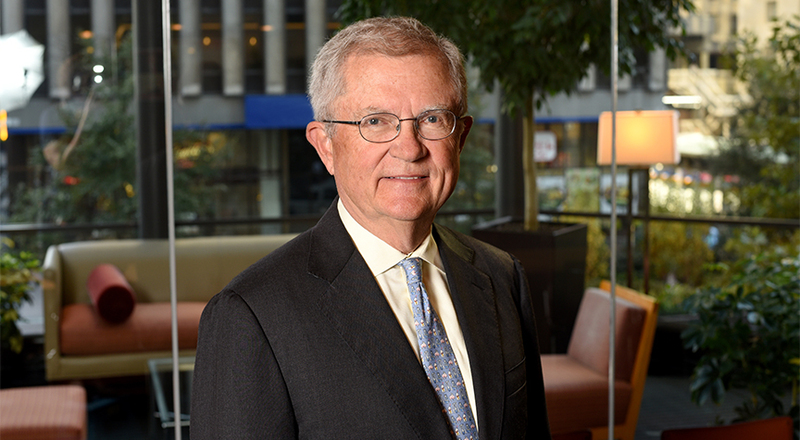 Jim's appointment as president and CEO followed 17 years of service to the Cincinnati Children’s Board of Trustees, including four years as chairman. Prior to joining the staff of Cincinnati Children’s, Jim was a partner in the general corporate department at Taft and was president of U.S. operations at Xomox Corp., a publicly traded manufacturer of specialty process controls. After serving many years as an independent director, Jim was appointed chairman of the board of the National Stock Exchange in October 2007. He joined the board of the Institute for Healthcare Improvement in May 2007. In January 2005, he was appointed chairman of the board of the Cincinnati Branch of the Federal Reserve Bank of Cleveland. Further, in July 2005, he was appointed to a national advisory commission that helped identify reforms necessary to stabilize and strengthen the Medicaid system. From 2003-2008, Jim served on the Ohio Third Frontier Advisory Board, which provides strategic planning for investments administered by the Ohio Third Frontier Commission. Jim holds or has held other director or officer positions for numerous corporations, including Meridian Bioscience, Inc., Gateway Investment Trust and the Ameritas Insurance Holding Company. His extensive civic involvement includes serving as a co-chair on the Regional Innovation Task Force, current director and former chairman of CincyTech, and board member and former chairman of Cintrifuse, as well as service to the Dan Beard Council of the Boy Scouts of America, the Cincinnati Museum of Natural History and the College of Mount St. Joseph. In addition to serving on the board of the United Way of Greater Cincinnati, Jim served as its 2006 campaign chair. Jim has published materials on leadership and transformational change in complex organizations, including a chapter titled "Governance, Leadership, Management, Organizational Structure, and Oversight Principles and Practices" in the book “Sustainably Improving Health Care,” edited by Paul Bataldan and Tina Foster. Jim is a graduate of Yale University (1963) and Vanderbilt School of Law (1966). He has been listed in Best Lawyers in America, Who’s Who in America and Who’s Who in Finance and Industry. He is a decorated veteran of the Vietnam War, where he was a member of the 1st Infantry Division.